В 1920-1921 годах "Dornier" разработала на базе самолета Libelle транспортную летающую лодку. Машина сначала получила обозначение Do L 1 Delphin I, измененное позднее на Do Cs II Delphin I. Самолет имел такую же компоновку, как и у предшественника, конструкция ДальшеMore>>> его была выполнена из стали и дюраля, а отличие заключалось в более высоком корпусе, позволившем организовать закрытую кабину. Прямо над ней было установлено крыло, которое поддерживали подкосы, крепившиеся к боковым поплавкам. Двигатель BMW IIIa мощностью 185 л.с. (138 кВт) был установлен в носовой части прямо перед открытой кабиной пилота, имевшего очень плохой обзор. Ниже и позади двигателя размещалась четырехместная пассажирская кабина. В 1922 году появился доработанный вариант Do L 1a с удлиненным корпусом лодки, вытянутая носовая часть которого позволила избежать забрызгивания винта. По бортам появилась пара ребер жесткости, переднюю часть кабины сделали наклонной, установили руль с балансиром и увеличили размах крыла. Еще один экземпляр Do L 1a был выпущен с полностью закапотированным двигателем. Помимо крайне незначительных продаж авиакомпаниям, один экземпляр Delphin I был куплен ВМС США, желавшими ознакомиться с самолетом цельнометаллической конструкции. Недостатки Delphin I были очевидны, и в 1923 году "Dornier" приступила к созданию Do L 2 Delphin II, совершившего первый полет 15 февраля 1924 года. Он мог оснащаться мотором BMW IV мощностью 250 л. с. (186 кВт) или Rolls-Royce Falcon III мощностью 260 л. с. (194 кВт), а в закрытой кабине размещался экипаж из одного или двух человек и шесть или семь пассажиров. Относительный коммерческий успех Delphin II (по два самолета были построены для заказчиков из Германии и Испании) открыл путь для более грузоподъемного варианта Do L 3 или Do L Bas Delphin III, созданного в 1927-1928 годах. Первый прототип этой машины, оснащенной двигателем BMW VI, взлетел 30 марта 1928 года. Экипаж самолета состоял из двух человек, сидевших в закрытой кабине, отделенной перегородкой от пассажирского салона, рассчитанного максимум на 11 мест. На днище лодки имелись стальные накладки, позволявшие в случае необходимости осуществлять взлет и посадку на лед. Самолет был выпущен в небольшом количестве в двух вариантах, отличавшихся формой окон кабины. IN our issue of March 31, 1921, we published an illustrated description of the Dornier all-metal monoplane, Do.C.III, produced by the Zeppelin-Lindau works. Particulars are now available of another Dornier monoplane, also all-metal. This machine is a flying boat and, like the C.III, it is fitted with the 185 h.p. Bavarian Motor Works engine, which is now so extensively used on German machines. For the illustrations and data relating to the Cs.II, as the flying boat is called, we are indebted to the German aviation journal Flugsport. Although resembling in general construction and fundamental design the C.III land machine, the Dornier Cs.II differs from that type in several respects, other than those necessitated by the fact that it is a seaplane. Thus the pilot, who in the land machine is seated behind the cabin, is placed between the engine and the front wing spar. From this position it is claimed that he obtains an excellent view, not only forward but also aft, his eyes being on a level with the wing, thus enabling him to look either over or under the wing. The engine mounting is somewhat different from that of the land machine. From the side view published herewith it will be seen that the engine is mounted high up in the nose, evidently with a view to providing sufficient clearance for the airscrew. Even then the risk of spray smashing the propeller tips would appear to be considerable, especially in anything of a seaway. On calm lakes and rivers, for which the boat is, we understand, chiefly designed, the clearance may be sufficient. This mounting of the engine certainly does provide one desirable feature for commercial work: that of accessibility. At the same time the engine is mounted so high that it has been possible to curve inwards the fuselage covering, thus narrowing down considerably the width of body immediately in front of the pilot, thereby giving him a much better view forward. Behind the pilot's cockpit is a compartment for luggage, and aft of that again is the cabin, with seating accommodation for six passengers. 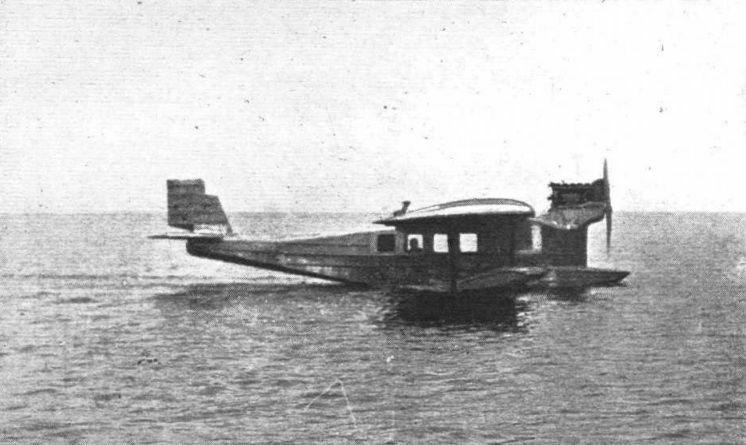 Regarded as a commercial proposition, the carrying of six passengers on a machine of the flying boat type with an engine of approximately 200 h.p. only must be considered extremely promising, and it is a question whether, taking everything into consideration, some of our own air lines would not do better by using a heavier power loading, even at the expense of a considerable amount of speed. The Dornier Cs.II has a maximum speed of 93 m.p.h. and a cruising speed of 75 m.p.h., which is very good for her power loading, and not a bad speed as compared with other means of transport. Disregarding for the moment the fact that she is a flying boat, the Do.Cs.II could do the London-Paris journey in 3 1/4 hours at cruising speed in still air, or in the same time at full power against a wind of 18-20 m.p.h. It is certainly open to doubt whether carrying six passengers at that speed and power loading (33.3 h.p. per passenger) would not be preferable, as a commercial proposition, to carrying only one passenger for each 65 horse power at a speed of 115 m.p.h. or so. It is true that having ample reserve power is a great safeguard against trouble, but at the same time, if flying is going to come down to a reasonable figure (without subsidy), some such reduction in the power required must be made. Constructionally, the Cs.II is similar to the land machine, being largely built of aluminium alloy. The boat is formed by extending downwards some distance the main fuselage structure to form the planing surfaces. As will be seen from the side view of the machine, there are two steps, one slightly aft of the c.g. and one farther aft. Strictly speaking, there are three steps, as quite a minute one occurs under the tail. The bottom of the hull is of Vee formation, pronounced in front of the front main step, less so for the remaining ones. The wings are of Duralumin construction, and are of deep, non-tapered section. There is one pair of sloping struts on each side, forming the only external wing bracing. Ailerons of considerable length, but of narrow chord, are fitted, and are balanced by small auxiliary planes carried on king posts above the wing. In order to ensure lateral stability on the water, two wing roots, springing from the sides of the hull, project outward a considerable distance. This method of stabilizing the machine when at rest is preferred by Herr Dornier to fitting wing tip floats, and certainly, whatever the resistance, these roots may conceivably give a fair amount of lift, whereas wing tip floats would give resistance only. How these wing roots would behave in a seaway we cannot say, but for use on lakes they may be presumed to be fairly efficient. Following are the main characteristics of the Dornier Cs.II: Length over all, 33 ft. 7 ins. ; wing span, 55 ft. 9 ins. ; chord, 9 ft. 10 ins. ; wing area, 506 sq. ft.; maximum height, 9 ft. 1 in. ; engine, 185 h.p. B.M.W. ; weight of machine empty, 3,190 lbs. (including cooling water and oil in engine); weight fully loaded, 4,520 lbs. ; fuel consumption per hour at full power, 85 lbs. of petrol, 4.5 lbs. of oil; consumption at cruising speed (75 m.p.h. ), 66 lbs. and 4.5 lbs. per hour respectively; maximum speed, 93 m.p.h. ; cruising speed, 75 m.p.h. ; ceiling, 13,000 ft.; wing loading, 8.95 lbs./sq. ft.; power loading (on basis of 200 h.p. ), 22.6 lbs./h.p. No figures are available regarding landing speed or climb. Dornier-Metallbauten G.M.B.H., Friedrichshafen a.B. - As one of the pioneers of German all-metal construction, Herr Dipl. Ing. Claudius Dornier occupies a somewhat unique position in German aeronautics. The Dornier-Metallbauten company is an offshoot of the Zeppelinwerk Lindau, and its origin is traced back to the days before the War, when the late Count Zeppelin founded the Seemoos factory in 1914. This factory was intended to be, and so remained, a huge experimental laboratory for the production of aircraft on novel lines. Even during the War Herr Dornier, who was in charge of the Seemoos factory, was allowed to continue his research work and was in the enviable position of not having to worry over much about commercial problems, the proprietors taking a long view and making up their minds that this particular factory should experiment with the future, rather than with the present, in view. Thus Herr Dornier has been able to develop methods of construction entirely his own, and some time after the War the name of the Zeppelin-Lindau works was changed to the present title of Dornier-Metallbauten G.M.B.H. The peculiar features of Dornier construction are that high-tensile steels are used for all heavily-stressed parts, while the rest is made of smooth Duralumin sheet. All joints are made either by riveting or by bolts. Welding and soldering is not used at all in any of the Dornier machines. At the present moment three different types of commercial machines are being produced in quantities at the Seemoos factory. These are: the "Komet," a tractor monoplane land machine, which is not unknown to habitues at Croydon; the "Delphin," commercial flying boat; and the "Libelle" sporting type of flying boat. The two machines shown on the Dornier stand were the "Delphin" and the "Libelle," both monoplane flying boats of all-metal construction. Photographs of both these types, as well as of the twin-engined "Wal," were published in our issue of July 26, 1923. The "Delphin" has already been described in FLIGHT, some two years ago. It is a monoplane with rectangular plan form wing, and with the peculiar "wing roots" growing out of the boat which in all Dornier flying boats form such a feature of the design. These wing roots have been chosen in preference to wing tip floats for the maintenance of lateral stability on the water, and even in the Dornier land machines they are retained and serve there as a support for, and streamline casing around, the wheel axle. The engine fitted as standard to the Dornier "Delphin" is the 185 h.p. B.M.W., and it speaks well for the aerodynamic efficiency of the design that even with this relatively small engine the machine carries pilot and six passengers. The cabin is provided with large windows of Triplex glass, and as there is no lower plane the view from the cabin is exceptionally good. The Duralumin boat hull is divided into 10 watertight compartments, so that in case of the hull becoming punctured there is small likelihood of it filling. In the original "Delphin" the engine was left entirely uncovered, but in the machine exhibited a certain amount of fairing behind the engine has been adopted, and the pilot looks out through an opening in the cowling, as indicated in one of our sketches. The boat hull is provided with two steps, as in all British flying boats, and the machine is prevented from "nosing in" by a forward extension of the boat. This projection has been added on more recent models, and was not a feature of the original experimental machine, which looked more like a Dornier land machine having steps in the bottom of its fuselage. The main characteristics of the Dornier "Delphin" are as follows: Length o.a., 11.5 m. (37 ft. 8 ins. ); span, 17.1 m, (56 ft.); weight empty, 1,450 kg. (3,180 lbs. ); useful load, 750 kg. (1,620 lbs. ); total loaded weight, 2,200 kg. (4,890 lbs. ); maximum speed, 150 km. (93 m.p.h. ); cruising speed, 120 km. (74m.p.h. ); ceiling, 4,200m. (13,800ft.). The range depends, of course, on the proportion of fuel to total useful load. At full throttle the consumption is 41 kg. (90 lbs.) of petrol and oil per hour, and at cruising speed 32 kg. (70 lbs.) per hour. Exhibited in the open, between Halls II and III, is a Dornier Dolphin III with B.M.W. engine. Designed for use over fairly sheltered waters such as for coastwise flying or operating from inland lakes, this machine is, strictly speaking, neither flying-boat nor seaplane, but something in between the two types. A single flying-boat hull, of small size, has been built on to the floor of what may be regarded as a fairly orthodox aeroplane fuselage, and lateral stability on the water is obtained as in the large Dornier flying-boats, by wing stumps growing out of the sides of the hull. The monoplane wing is braced by struts as in the large flying-boats, and the engine is mounted high above the forward part of the fuselage so as to give clearance between the propeller tips and the forward deck of the hull. The pilot is situated in a forward part of the cabin, where large windows give him a good view forward and sideways, although upwards and downwards his view is entirely cut off by the engine housing and hull respectively. Constructionally the Dolphin III is based upon the same principles as those adopted in the large Dornier flying-boats. The cabin has seating accommodation for 10 passengers, and the pilot's cockpit is equipped with dual controls, enabling two pilots to take turns at controlling the machine. The range of the Dolphin III is not as great as that of the Superwal, the petrol supply being normally 570 litres (125 gallons), and 60 litres of oil (13-2 gallons). The overall length of the Dolphin III is 14-35 metres (47-1 lbs. ), and the wing span 19-6 m. (64-3 ft.). The weight empty is 2,650 kg. (5,830 lbs. ), and the normal gross weight 3,700 kg. (8,140 lbs). The maximum speed is 190 km. per hour (118 m.p.h. ), and the cruising speed 150 km. per hour (93 m.p.h.). Dornier Monoplane Flying Boat "Cs. II, 1920": Side View. DORNIER MONOPLANE FLYING BOAT "CS.II, 1920": Front View. AN ALTERED DORNIER CS.II: In our issue of April 21, 1921, we published an illustrated description of the original Dornier Cs.II. We have now received the accompanying photograph, which shows the machine with altered bow. The hull portion has been extended forward of the nose of the body so as to protect the tractor airscrew against spray, and also to prevent the machine from nosing over. We understand that the alteration has greatly improved the seaworthiness of the machine. The Dornier "Delphin," a monoplane "cabin" flying boat of somewhat unusual design. Two views of the altered Dornier Cs.II: The alteration to the front of the hull is clearly visible in these views, which give a good idea of the steps. A description of this machine was published in our issue of April 21,1921. We understand that Van Berkels of Rotterdam have obtained the agency for this machine in Holland. Несмотря на свой неуклюжий внешний вид, Dornier Delphin широко использовался для коммерческих перевозок. Этот снимок Do L 2 Delphin II сделан в 1924 году. 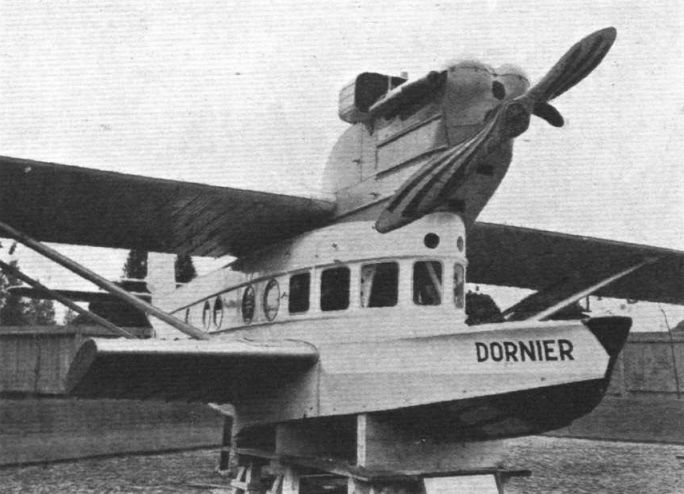 The Dornier "Dolphin": Developed from the "Komet" type of landplane, this machine has a central hull added to a normal fuselage, but with an unusual engine placing. SOME DORNIER DETAILS: 1. 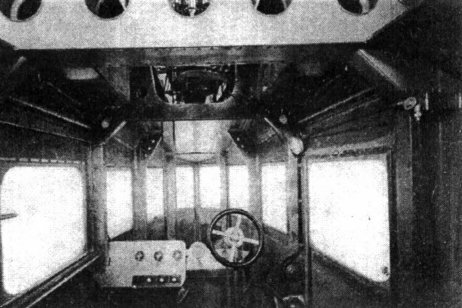 The "window" in the pilot's cockpit of the "Delphin." 2. View from below of the steps of the "Delphin."